dedicated to bringing trauma-informed yoga and meditation to prisons, jails, and detention centers. We are built on a foundation of volunteerism, generosity, and service. A generous and engaged community is the heart and soul of Yoga Behind Bars. Whether you are a yoga teacher, interested in criminal justice reform, or simply curious about our work, you can help fuel our innovative programs! Yoga Behind Bars Informational Session from Yoga Behind Bars on Vimeo. Curious about our work, why and how we do it, and how you can be part of it? Check out our online Info Session here. Do you want us to speak about Yoga Behind Bars at your yoga studio, organization, business, or place of worship? Please reach out to Jess, our Programs Director. Our online trauma-informed yoga training gives you practical tools to make a difference in your community. Whether you practice yoga or are a yoga instructor, clinician, mental health professional, educator—we’ve got you covered. Learn more. 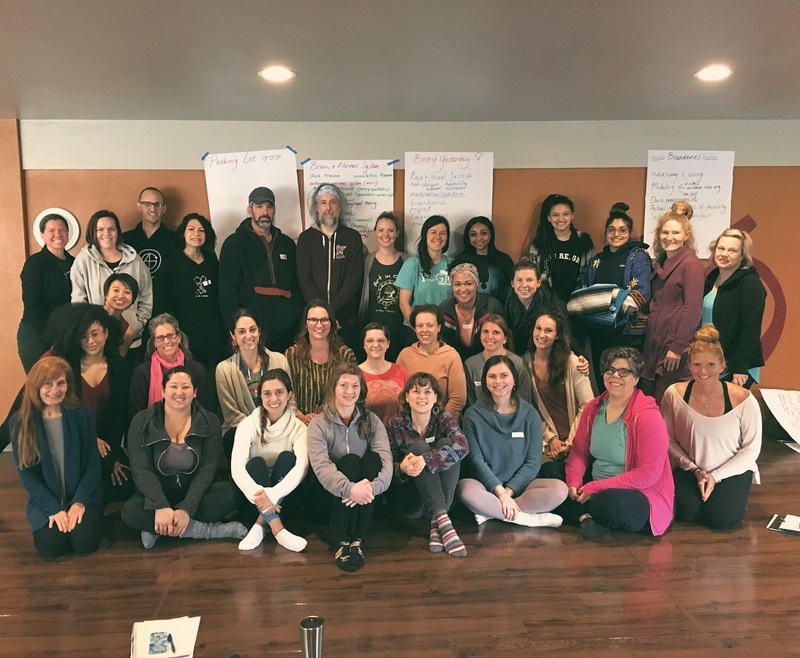 Our 3-day Trauma-Informed Yoga training is open to anyone interested in or currently working with trauma and vulnerable populations. Participants include social workers, yoga practitioners and teachers, health care professionals, and educators. We offer a unique and practical roadmap for leveraging the power of yoga for increased well-being, trauma recovery, and lasting social change. See below for upcoming trainings and what to expect. Interested in starting or enriching your own program? Please contact Jess if you’d like to host our training in your community. Registration will open on July 8. Volunteer opportunities suit all sorts of schedules and interests. It truly takes a village to make our work possible. We are always looking for people with various backgrounds, talents, and skill levels to support us both behind bars, behind desks, and in the community. Want to learn more about YBB and how you can help? Please contact info@yogabehindbars.org and check out our online info session at the top of this page! Read more about our Ambassador program here. When you teach for Yoga Behind Bars, you build a bridge between two worlds. It is an experience that will change your life and the lives of your students. Offering yoga in a prison environment is undeniably challenging and also incredibly rewarding. Because of this, we encourage applicants who have a strong sense of commitment, skill, and capacity for compassion. Sign up for our Trauma-Informed Yoga training. A 200-hour certification is NOT required to come to our trainings! To be a lead teacher with us we require that you complete a 200-hour Yoga Teacher Training or equivalent experience. We also have openings for classroom assistants for which a 200-hour certification is not necessary. Joining the YBB teacher team can take time. Prisons and jails often have lengthy application processing times and we have to work with the schedule restrictions placed on us. After your paperwork is processed and cleared by a facility (yay! ), we offer extensive mentoring and all active instructors have access to free continuing education workshops throughout the year. We also support people outside of Washington State who are interested in starting or enriching their own programs. Please contact Jess if you’d like to host our training in your community. Yoga Behind Bars (YBB) is searching for a skilled and passionate Executive Director (ED) with experience leading programs and social justice initiatives through change to take the organization into its second decade on strong footing. The ideal candidate can develop and implement a strategic vision focused on creating sustainable, diverse income sources, and will excel at people management. Our new ED will be a compassionate and transparent leader with experience being accountable to a variety of internal and external stakeholders. The ideal candidate will be an engaging and inspirational speaker, have a keen understanding of mass incarceration’s personal and systemic impacts, and have the capacity to recognize and affirm the humanity in us all. Please forward widely to your networks. ** The initial review date for applications has changed. The original posting listed late April. We will now begin responding to applications in early May. But it starts with you and with each other.